Draft No. 4 is a master class on the writer’s craft. 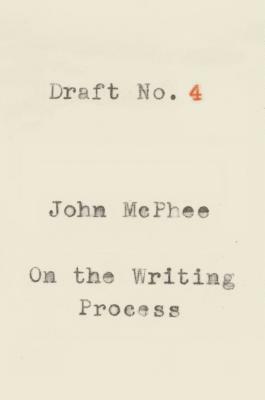 In a series of playful, expertly wrought essays, John McPhee shares insights he has gathered over his career and has refined while teaching at Princeton University, where he has nurtured some of the most esteemed writers of recent decades. McPhee offers definitive guidance in the decisions regarding arrangement, diction, and tone that shape nonfiction pieces, and he presents extracts from his work, subjecting them to wry scrutiny. In one essay, he considers the delicate art of getting sources to tell you what they might not otherwise reveal. In another, he discusses how to use flashback to place a bear encounter in a travel narrative while observing that “readers are not supposed to notice the structure. It is meant to be about as visible as someone’s bones.” The result is a vivid depiction of the writing process, from reporting to drafting to revising—and revising, and revising. Draft No. 4 is enriched by multiple diagrams and by personal anecdotes and charming reflections on the life of a writer. McPhee describes his enduring relationships with The New Yorker and Farrar, Straus and Giroux, and recalls his early years at Time magazine. Throughout, Draft No. 4 is enlivened by his keen sense of writing as a way of being in the world.